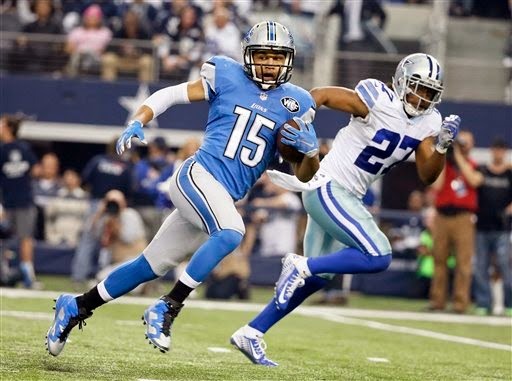 Lions wide receiver Golden Tate has been added to the Pro Bowl roster replacing Eagles wide receiver Jeremy Maclin who is out for personal reasons. Tate had 99 catches for 1,331 yards in his first season in Detroit. This marks the first time in Lions’ history that two wide receivers — Tate and Calvin Johnson — have been named to the game. It's the first time since 1966 that two players at the same position — defensive tackles Roger Brown and Alex Karras — were named. Safety Glover Quin and defensive tackle Ndamukong Suh were also selected to the Pro Bowl. Johnson and Suh have opted out. The Pro Bowl will be played on Sunday, Jan. 25 at the University of Phoenix Stadium in Glendale, Ariz., which is also the home of the Super Bowl. It will be televised on ESPN.